Georges Bourgoignie of Fraser Yachts tells me he's closed on the sale of the 32m motor yacht Cassiopeia with Rytis Babravicius at Camper & Nicholsons bringing the buyer. Launched by Holland Jachtbouw in 2004, Cassiopeia combines impressive performance and fast cruising speeds with tradition and elegance. A popular charter yacht, Cassiopeia's traditional teak interior is complemented by sophisticated entertainment and communications systems, not to mention a vast array of watersports equipment: the perfect combination of what is best in old and new. Immaculately maintained with only one owner over her lifetime, this charming gentleman's motor yacht is in excellent condition. Accommodation is for seven guests in a master suite, VIP cabin and a twin cabin with Pullman berth while twin 1,800hp engines give her a cruising speed of 17 knots. 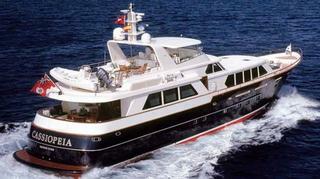 Cassiopeia was asking $4.9 million.